When SYNC 3 tries to connect to a network that supports 802.11r, it says “I want to use 802.11r” and “I want to use non-802.11r security”. That’s not allowed, so it can’t connect. I know precisely why this happens and all I want is for Ford to fix it. No luck so far. When SYNC 3’s 802.11n client software attempts to connect to an access point that supports 802.11r Fast Transitions, it attempts an 802.11r FT association using a non-802.11r security scheme. This is expressly prohibited; the standard requires that access points refuse such connections. As a consequence, SYNC 3 is unable to connect. First is the Mobility Domain element (MDE). This element indicates that SYNC 3 a) is aware of 802.11r and b) wishes to connect to a specific 802.11r mobility domain. The inclusion of an MDE makes SYNC 3’s association request an “FT initial mobility domain association in an RSN” per IEEE Std 802.11-2012 § 12.4.2. It also doesn’t make any objective sense, because fast transitions simply depend on FT authentication. another with 802.11r disabled, where SYNC 3 can connect. These were recorded minutes apart using the same Ford vehicle and the same Ruckus access point. The only change was whether the access point advertised its 802.11r capabilities. Such an association frame must be rejected by the access point; see IEEE Std 802.11r-2008 page 54 or IEEE Std 802.11-2012 page 1312. The theory which I’ve long advanced is that there’s two components inside SYNC 3, one of which is attempting 802.11r when it sends the association request frame, and another of which is not attempting 802.11r when it handles authentication. Late December, someone posted SYNC 3’s 2.2 update which finally gave me a chance to find out. That archive contains HN1T-14G381-LG.tar.gz, which contains apps.tar.gz, which contains a QNX6 filesystem holding some software. This software image offers confirmation of this theory. SYNC 3 uses the usual wpa_supplicant for its 802.11 authentication exchanges. This program can support 802.11r, but it must have 802.11r turned on at compile time via CONFIG_IEEE80211R and it must be configured at runtime to use key_mgmt=PSK FT-PSK. The default key_mgmt does not include FT-PSK. /usr/sbin/wpa_supplicant_ti18xx can be found inside /ifs/second-ifs, and it looks like it was compiled with 802.11r support. The key management configuration parser checks for FT-PSK and FT-EAP only if it actually supports 802.11r, and that’s what’s in this build. So: if the WPA supplicant supports 802.11r, why doesn’t it work? However, besides the default of key_mgmt=PSK, the only possible key management configuration is key_mgmt=NONE. The generated configuration files never contain key_mgmt=FT-PSK, meaning that wpa_supplicant can never attempt FT authentication. This is why the AKM suite in the association request lists only 00-0F-AC:2 (which is key_mgmt=PSK) and not 00-0F-AC:4 (which is key_mgmt=FT-PSK). In other words: the SYNC 3 wifi subsystem supports 802.11r, but the Ford software configuring it never enables 802.11r authentication. Solution 2 could be accomplished by making NET_WifiConnectionMgr set key_mgmt=PSK FT-PSK instead of relying on defaults. Adding that single line to the config file would fix this problem. Ford is tracking this issue as CAS-9606059, a research case opened 2016-05-31. I also reported this issue using several other channels earlier in the month of May, but none of those Ford representatives were able to give me any identifier. On June 6, a Senior Business Analyst at Ford contacted me asking me to try disabling authentication or to use a different password. I informed her that I had already performed much experimentation, and that I could send two packet captures – one showing SYNC 3 connecting to an access point successfully, and another showing SYNC 3 failing to connect to that same access point once 802.11r is enabled. She allowed me to forward these packet captures by email. I also included a dissection of one problematic association request, showing that SYNC 3 selected a non-FT AKM and included a mobility domain element in violation of the 802.11 standard. On July 14, a different analyst contacted me to say that the issue was still open, and to ask if I could send over those packet captures. I forwarded the email from June, which she acknowledged but which her reply only partially quoted. I replied again attaching a PDF of my June email, which she acknowledged again. Over the next several months, I received periodic phone calls from Michigan telling me that the case is still open and that there’s no ETA. On November 15, I emailed the second analyst again asking for a status update. A brief discussion ensued, and I pointed out that I had completed research into this bug and provided my technical findings to my dealership within 72 hours of taking delivery of my vehicle, and that Ford appears to have sat on it for six months and made no progress. On November 16, I was told that the issue had been sent to CCT Escalation and that Engineering remained in the loop. This escalation is identified as CAS-9606059-T9J7D6 CRM:00013000000371. On November 17, I was contacted by a Ford Regional Customer Service Manager who informed me that she would be happy to assit with her technical resources… once I dropped off the vehicle at a Ford dealership. I replied that I understood she had a protocol to follow, but that it makes little sense for me to drop off my vehicle given the nature of the problem – that instead, someone at Ford could read my report, look at their software, find and fix the problem without requiring my car. I also added that I would be willing to drop off my car anyway at any of the six closest dealerships anyway, so long as a comparable loaner was available. 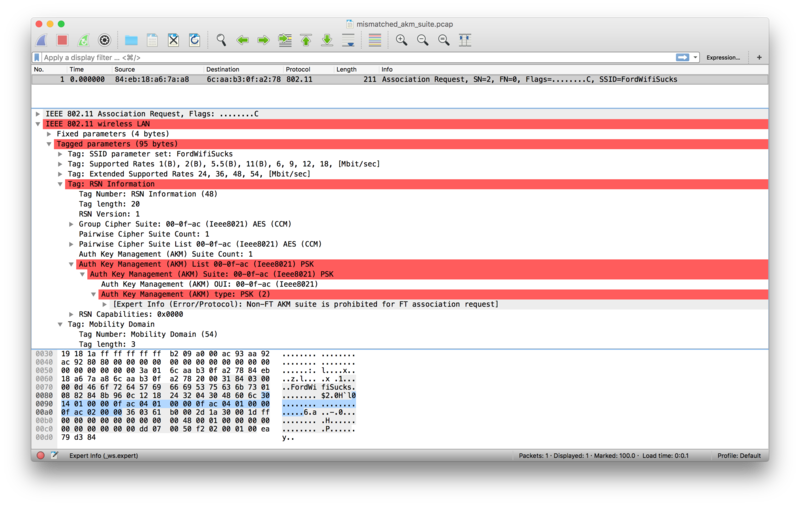 Also on November 17, it occurred to me that Wireshark (the protocol analyzer of record) can and should identify this issue automatically. I opened a bug describing the feature I think it should have, submitted a patch, and got it merged 🎉. The association request frames now look like this, making this issue obvious without needing to squint at IEEE standards. Over the next several days, I had a back-and-forth with the Ford Regional Customer Service Manager about how to proceed with this case. She needs me to go to a dealership and do something to demonstrate the issue. I explained that bringing my network with me would be an ordeal, and asked if I could bring electronic evidence instead – say, a video of me using my car trying to connect to my network along with packet captures of the exchange. She seemed to think that would work, but I went a step further. Ultimately, all I need to demonstrate the issue is an 802.11r-capable access point, so I ordered up a $30 router. It arrived on November 25. I then flashed it with a stock OpenWRT image, configured it for 802.11r, and went out to my car with the box and iwcap… only to find that hostapd doesn’t actually validate the AKM suite as required by the 802.11 standard. So, I fixed hostapd, built and installed a replacement wpad package, verified that it now corrrectly refuses the broken association request, and submitted my patch (which was subsequently merged 🎉). On November 25, I told my contact at Ford that I have a portable 802.11r lab that I can bring to the dealership of her choosing. On November 30, I brought my vehicle to a dealership per Ford’s request, where they identify this as repair order number 6220998. The dealership was not interested in my portable 802.11r lab, but the technician at the dealership’s service center was able to confirm the issue using their internal wireless network, which apparently is also 802.11r-capable. They referred the case to some internal Ford hotline. I registered ford-wifi-is-broken.com on December 6 and redirected it to the GitHub gist that had been tracking this information. I wanted it to be easy for anyone at Ford to find my description of the problem. It completely ignores her previous email (which I quoted) wherein she recommended additional action. It completely ignores my questions which all concerned that additional action. The Ford dealership confirmed an issue with the vehicle, and like me, does not accept this resolution. There is no such thing as a “connection point”. She means “access point”, but all three of them – my usual, my lab, and the dealership’s – are refusing the car’s connection attempts exactly as required. The document she would have me reference is entirely useless. Even the phone number she provided is wrong. That is the problem. Someone at Ford engineering should dig into the wifi section of the SYNC 3 software, where they’ll find that the WPA supplicant does not support 802.11r, and that the component sending association requests is configured to request 802.11r anyway. That is why SYNC 3 would send this kind of invalid frame. They can either a) tell the component sending association requests not to request 802.11r, or b) keep requesting 802.11r and teach the WPA supplicant how to handle 802.11r. That is this fix. Google led me to 800-392-3673 (800-392-FORD), where I reached a representative who found this case and referred it to Tier 2 within the In-Vehicle Technology group. I hope that’s a step in the right direction, though if is, I’ll draw unpleasant conclusions about the Customer Care Team which has a) had this information for months and b) somehow never contacted the IVT group on my behalf. I also got a call from the service desk at the dealership, a member of which was CC:ed on my reply, who informed me that the dealership is still trying to get the Field Service Engineer out to the dealership to address this issue. He’s hopeful that the engineer will be more available now that the holiday season is winding down. On December 29, I dug into the SYNC 3 software and found additional information relevant to this issue. SYNC 3 v2.2’s wpa_supplicant is never configured to attempt 802.11r authentication, despite the vehicle attempting to associate to a 802.11r mobility domain. I emailed again insisting that the case be re-opened. I then reached out to essentially every contact I’ve ever had, asking that my analysis be added to the case. ^SN at @FordService was the first to agree on December 30. This site is written by Will Glynn. Ford people: find me at CAS-9606059. This document has been public since May 2016, as is its history. Even the very first version had all the information needed to find and fix this.